Successfully Added 3D LED Lamp NCC-1701 Enterprise - Theme Light, 8 Light Modes, 7 Colors, AA Battery, USB Port to your Shopping Cart. This 3D LED lamp is one for the Star Trek fans and looks simply amazing in any room. 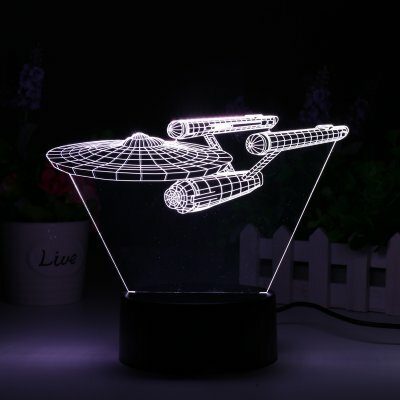 With its USS Enterprise design, this LED lamp looks like a computer or holographic projection and is a superb replica of the NCC-1701 Enterprise that featured in the original Gene Roddenberry TV series and movies. This stylish light has an etched acrylic plate which when lit up by the LEDs in the base displays a fantastic 3D version of the iconic Enterprise starship that was captained by James T. Kirk. This Enterprise LED light takes a few seconds to set up and you can select from one of seven colors, blue, red, green, cyan, purple, yellow, and white with an 8th option to cycle through the colors automatically. Powered by the supplied USB lead or 3 AA batteries (not included ) it's a perfect addition to any sci-fi fans' desk or home and can run from your computer or other USB port. It makes a great mood light for any room of your home, shop, cafe, theme bar or restaurant and is a fascinating addition to any Trekkie collection so you can boldly go where no man has gone before. this LED lamp comes with 12 months warranty, brought to you by the leader in electronic devices as well as wholesale LED lights and gadgets..
Arabic: - الصمام الخفيفة ستار تريك - Chinese Simplified: - LED 灯星际迷航 》 - Czech: - LED světlo Star Trek - Danish: - LED lys Star Trek - Dutch: - LED licht Star Trek - French: - Lumière LED Star Trek - German: - LED-Leuchte Star Trek - Hebrew: - מסע בין כוכבים נורית - Hindi: - एलईडी प्रकाश स्टार ट्रेक - Italian: - Luce LED Star Trek - Japanese: - LED ライト スター ・ トレック - Korean: - LED 빛 스타 트 렉 - Malay: - Lampu LED Star Trek - Norwegian Bokmål: - LED lys Star Trek - Romanian: - Lumina LED Star Trek - Russian: - Светодиодный свет Звездный путь - Spanish: - Luz LED Star Trek - Thai: - ไฟ LED Star Trek - Turkish: - LED ışık Star Trek - Vietnamese: - LED Light Star Trek.